Royal China (USA).... Rosemary....22K Gold...Pink Roses...Gray Leaves... Saucer. 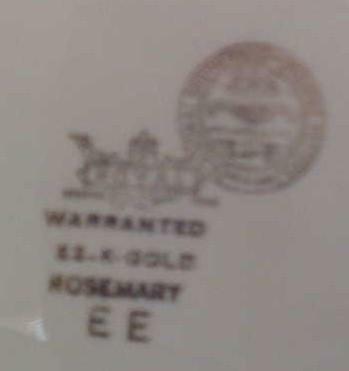 Marked on the back "Royal China...Sebring, Ohio...Rosemary....22K Gold". 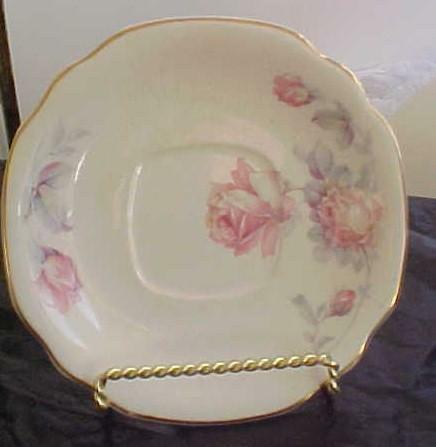 Saucer measures approximately 6" x 6". There are 3 flea bites along the edge and ALOT of crazing, but no chips or cracks. There is also wear to the gold trim. Nice vintage piece to add to your collection. In good, used condition. PRICE: $6.99 plus $1.50 special handling charge.